Fish head steamboats is usually a dish that one would dine out for. But what if I told you that you can prepare your very own Fish head steamboat at the comfort of your own home? No need for queuing under the hot weather, and you can even add your favorite type of steamboat ingredients? 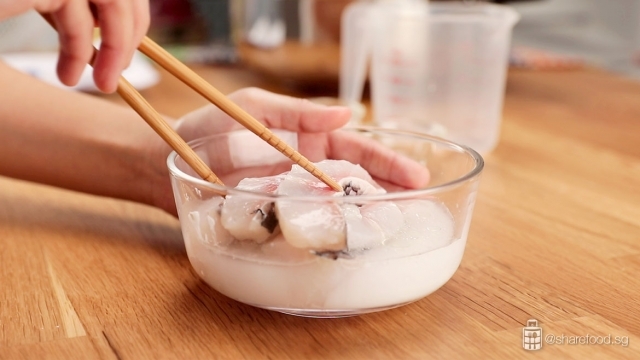 This recipe is made for all those who swears by fish head steamboat! And this is made possible thanks to one of our top contributor of home cooks, Cheng Geck Chau. Here’s a list of ingredients that you will need for this recipe: 1 full fish head – cut into 2, 1 set of fish bone, 500g of fish meat – sliced into 1cm thickness, 60 of dried sole fish, 500g of yam – cut into large pieces, ½ Chinese cabbage – cut into 1 inch wide and set aside the stem for the soup base, 50g of ginger – deskin and sliced, ½ tablespoon of white pepper seeds, 250g of red tomatoes – cut into wedges, 4 liters of chicken stock, 5 sprigs of coriander – cut out the roots and save the leaves for garnishing, 1 cup of soya bean and 1 cup of corn flour. A 28cm x 10cm durable stainless-steel hotpot that provides lasting durability and the induction is compatible for all cooking tops! Hold up! 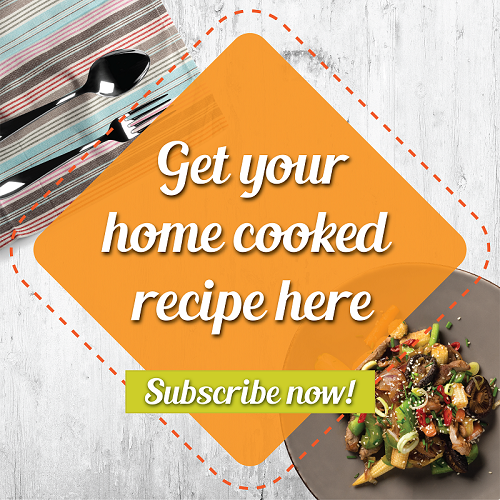 Too many ingredients for your pot at home? Worried that it might not be able to fit? Let us tell you our secret. 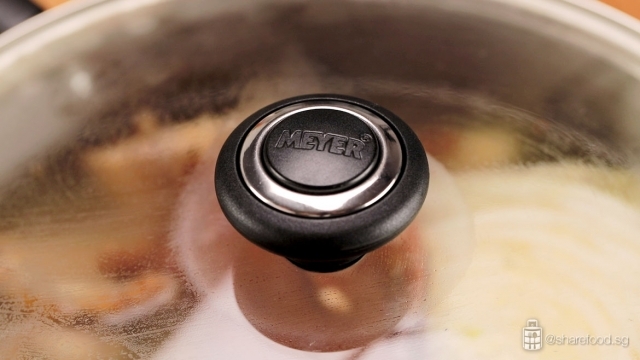 We made this recipe by using the Meyer Hot Pot with glass lid. 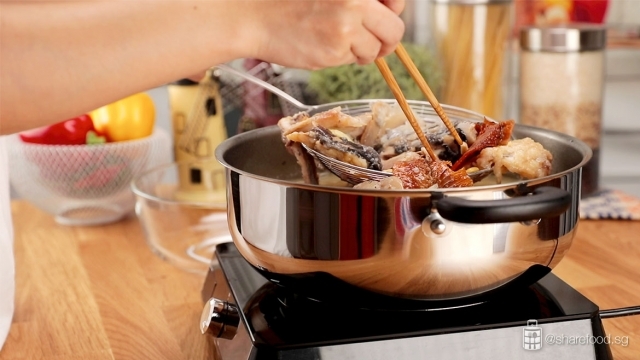 A 28cm x 10cm durable stainless-steel hotpot that provides lasting durability and the induction is compatible for all cooking tops! What’s even better is that it has tempered glass lid that is breakage resistant and it is see-through for convenience! This versatile pot can be used for all cooking purposes, not only for steamboat. With its fast heating and even heat distribution, your food will be cooked in no time! Moving on, for the sliced fish marinade, all you need is 150ml of water, ½ teaspoon of oil, 1 tablespoon of corn flour and ½ teaspoon of salt. Some optional condiments that you might want to add in: ½ teaspoon of salt, 1 teaspoon of fish sauce and 1 tablespoon of Chinese cooking wine. 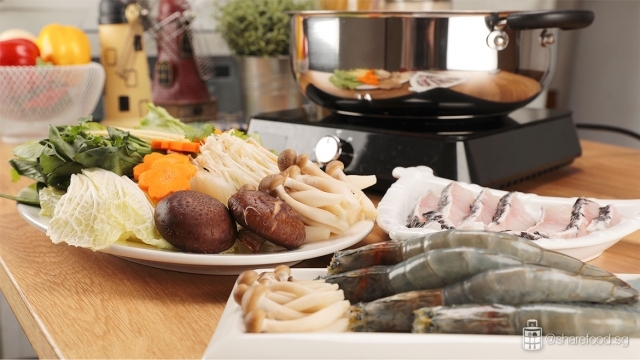 And lastly, feel free to prepare all your other favorite ingredients for steamboat! With the Meyer Hot Pot, you don’t have to worry about not having enough space as the pot size is 3.8 liters and can feed 5-8 people! Let’s start to prepare the fish. Add in sliced fish and the fish marinade into a bowl and mix it evenly. Then, cling wrap and set aside in the chiller. Rinse the fish head and bones and pat dry with a kitchen towel. Proceed to pour 1 cup of corn flour on a plate and coat the fish head and bone with corn flour thoroughly, shake off the excess flour and set aside. 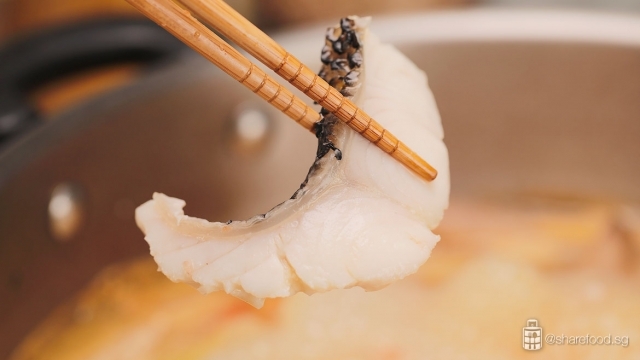 Do note that the fish gets cooked quite fast, so remember to reduce the temperature! Next, heat up a pot with 300ml of cooking oil. Add in yam and pan fry till it’s light and fluffy and place it on plate with kitchen towel to drain the oil. Add in dried sole fish and fry till golden brown and crispy then set aside. Do note that the fish gets cooked quite fast, so remember to reduce the temperature! Add in fish head and bones and fry till dark golden brown. Proceed to let it drain and set aside. It’s time to cook the stock! Pour off the excess oil in the pot and return it back to the stove. Then, add in fried fish head, bones, sole fish, ginger, soya bean, the stem of the white cabbage, white peppercorn, coriander roots and chicken stock. Add in more water to ensure that all the ingredients are submerged in water and give it a good stir. Once it’s ready, use a sieve to remove the ingredients and the soup should be cream-coloured! Boil the soup base for 15 mins and keep it covered to simmer for 1 hour and 30 mins. Remember to monitor the water level every 15 mins to ensure that it is not dried up and top up more water if necessary. Once it’s ready, use a sieve to remove the ingredients. The soup should be cream coloured by now and you can season the soup with the optional condiments to your preference! Lastly, add in the fried yam and Chinese cabbage. Then, remove the fish from the chiller and place it on a serving plate. Serve this soup base with the rest of your favorite steamboat ingredients! When the soup runs low, you can top it up with the remaining chicken stock. Your very own personalized fish head steamboat packed with all your favorite ingredients inside. And here you go! 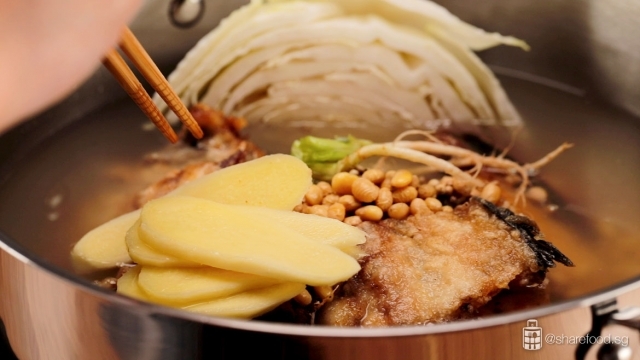 Your very own personalized fish head steamboat packed with all your favorite ingredients inside. Steamboat is always a good comfort food. Best eaten when the weather is cold. But who’s to say that you can’t have it at anytime of the day? 5 sprigs of corriander cut out the roots and set aside. Use the leaves for garnishing. In a bowl, add in sliced fish and marinade. Mix it evenly, cling wrap and set aside in the chiller. Rinse the fish head and bones. Pat fry with kitchen towel. Pour 1 cup of cornflour on a plate. Coat the fish head and bone with cornflour thoroughly, shake off excess flour. Set aside. Heat up pot with 300ml cooking oil. Add in yam, pan fry till it’s light and fluffy. Drain and place it on a plate with kitchen towel. Set aside. 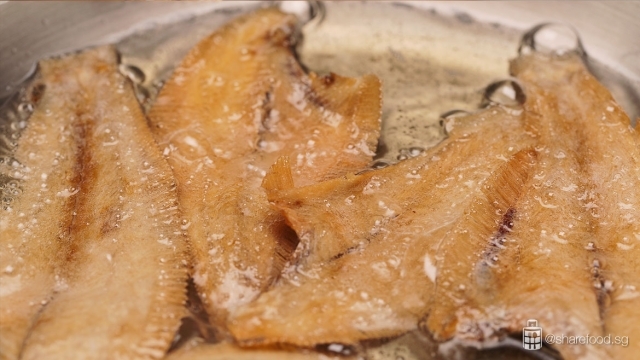 Add in dried sole fish, fry till golden brown and crispy. Set aside. #Tips: Reduce the temperature as the fish gets cooked quite fast. Add in fish head and bones, fry till dark golden brown. Drain and set aside. Pour off the excess oil in the pot and return it back to the stove. Add in fried fish head, bones, sole fish, ginger, soya bean, stem of white cabbage, white peppercorn, coriander roots and chicken stock. Add in more water to ensure that all the ingredients are submerge into the water. Give it a good stir. Boil the soup for 15 mins. Keep covered and simmer for 1hr 30 mins. Monitor the water level every 15 mins to ensure that it is not dried up. Top it up with more water as necessary. Once it’s ready, use a sieve to remove the ingredients. The soup is cream coloured now. Season the soup with the optional condiments to your preference. Add in fried yam and chinese cabbage. Remove the fish from the chiller and place it on a serving plate. Serve this soup base with the rest of the steamboat ingredients. When the soup runs low, top it with the remaining chicken stock.